Higgins Clough (or Shaly Knowl) Swivel Bridge, c.1930. This bridge is in close proximity to the site of Hag Bank Pit and it is seen looking northwards towards Marple. 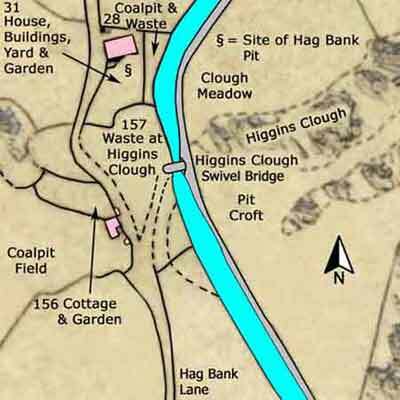 Hag Bank Pit was situated on the offside of the canal adjacent to Higgins Clough (Disley or Shaley Knowl) Swivel Bridge. It stood on land owned by Thomas Legh (1792-1857) of Lyme Hall and it is possible that the sinking of the shaft was contemporary with the opening of the upper level of the canal on the 31 August 1796, although there no evidence for this. This pit was originally worked by Messrs J & J Dodgson (John and James). Coal gained from it was used to fire the company's three lime kilns situated close by and an important customer was Samuel Oldknow who bought coal from them to fire his lime kilns at Marple. 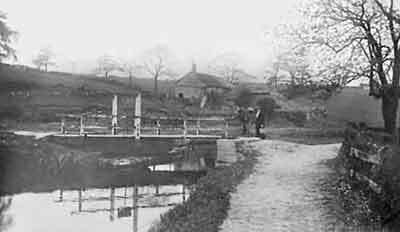 Coal was carried by boat to Marple, a distance of three miles. 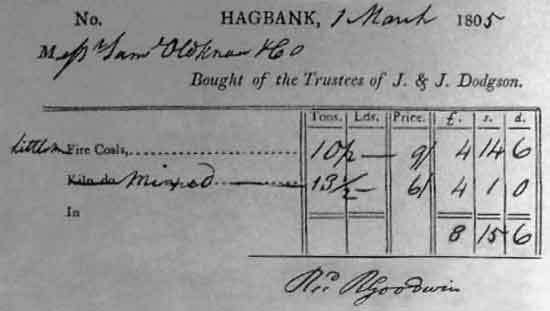 By 1805, Hag Bank Pit was being worked by the Trustees of Messrs J & J Dodgson, so presumably the brothers had died. In 1806 a newspaper advertisement was offering the pit and associated lime kilns for sale or letting. The schedule accomanying the 1851 Tithe Map shows that by this time the occupier was James Clayton who was also working the pit. The Ordnance Survey map for 1872 shows it as an 'Old Shaft' but it was reopened by Sampson Maiden who worked it during 1875-76 after which it closed again. Sampson Maiden was also working a pit in Disley over the period 1872-88. The above bill, dated 1 March 1805, is for 'Little Fire Coals' and 'Mixed' (Coals) bought by Samuel Oldknow & Company from the Trustees of J & J Dodgson. The bill was signed for at Marple Lime Works by the Clerk, R Goodwin. 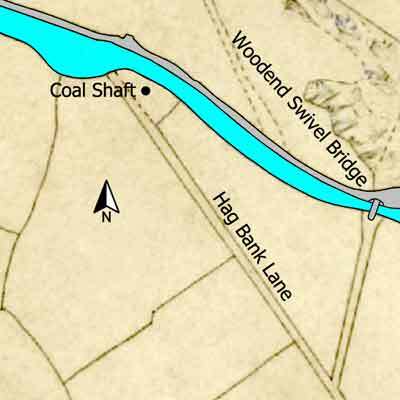 A short distance before Woodend Swivel Bridge and Hag Bank Pit is the site of a coal shaft that was associated with Hag Bank Pit. The shaft was not recorded on the Tithe Map but the occupier was James Clayton and the landowner was Thomas Legh. This was the same as at Hag Bank Pit. This pit was once operated by the Trustees of J & J Dodgson and an unused coal bill, dating from the period 1800-1809, has survived and is shown below. 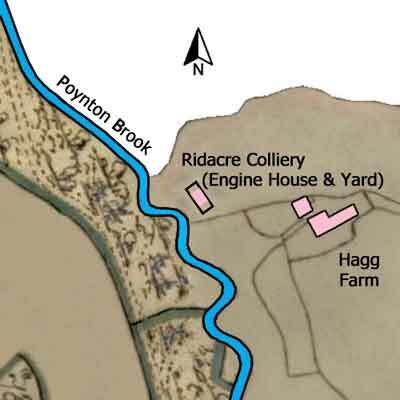 Ridacre Colliery was situated in the township of Lyme Handley in the parish of Prestbury. At the time of the tithe map illustrated below (c.1850) the landowner was Thomas Legh and the occupier was William Barton. The number of seams (or mines) worked is unknown but one of them was called the Bengee Mine. The Macclesfield Canal (opened 1831) is just off the Tithe Map (shown below) to the east, and the colliery is close to Hagg (or Ryle's) Swivel and Foot Bridges (No. 16). If the Trustees of J & J Dodgson ever supplied coal from Ridacre Colliery to Marple Lime Works then at this time it would have been transported there by horse and cart.